Skiing can be intimidating—both skill-wise and money-wise—especially if your family is new to the slopes. But most ski resorts offer trails and programs for beginners, many of them tailored to children specifically. 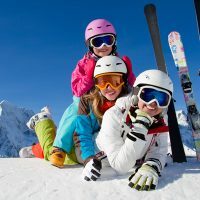 Many ski resorts also offer additional activities for families (both on and off the mountain), along with packages and discounts for opportunities to save. These ski resorts do all of the above (and then some), making them our favorite family ski resorts for the 2018-2019 season. Okemo Mountain Resort is an all-season, destination resort that caters to new skiers with programs separated by age group: 3 (Little Dippers), 4 to 6 (Snow Stars) and 7 to 14 (Mountain Explorers). It also offers a mountain coaster, ice skating, snow tubing and kids’ snowmobiling, along with restaurants and Kids Night Out — a childcare program that allows mom and dad to enjoy a romantic dinner on the mountain. Tucked away in northwestern Montana—about 30 minutes from Glacier National Park—Whitefish Mountain Resort is a hidden gem for families. The four-season resort offers ski lessons for children ages 7 and up, as well as a fantastic kids’ center for those who aren’t quite ready for the slopes. Nighttime skiing is especially fun on the mountain! After a few runs, enjoy apres ski at a number of restaurants and bars on the property, or visit the Summit Nature Center, where kids can become Junior Snow Rangers. 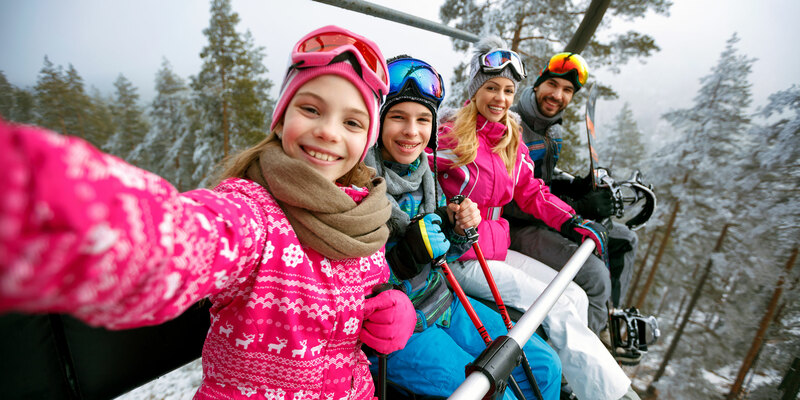 Camelback Mountain Resort offers all the necessities for a successful ski vacation in the Poconos — ski and snowboard lessons, tubing, two terrain parks and a mountain coaster (rides are self-controlled — go as fast or as slow as you want!). There are also several options for dining and accommodations, including the Camelback Lodge & Indoor Water Park. Spend your days on the slopes and your nights on the slides! Located in the Northern Berkshires of Massachusetts (less than hour from Albany, New York), Jiminy Peak Mountain Resort is a must-visit ski resort for families — particularly those with learning skiers. Ski and snowboard lessons are available to children ages 3 to 14, and include lunch and hot chocolate breaks. When it’s time for the whole family to rejoin, grab a bite to eat at John Harvard’s Brewery & Ale House (located at the Country Inn, also on the mountain), or relax by the fire pit with S’mores. Part of Stratton Mountain Ski Resort is located at the highest peak in Southern Vermont, yet 40 percent of its terrain is classified novice; another 35 percent of it is designed for intermediate skiers. Both group and private lessons are available to beginners, as are seasonal programs separated by age group. When it’s time for a break from the slopes, families can take a dip in the resort’s pool or head to the postcard-perfect Village of Stratton, where restaurants await visitors in search of hot chocolate and other comfort food. Let the kids experience a special piece of Yosemite National Park: Yosemite Ski & Snowboard Area. It is the oldest ski resort in California, and its small size makes it a prime place to take your newbie skiers. Children can participate in the Badger Pups Downhill Ski/Snowboard Program, with one or two lessons for ages 4 to 6, or participate in learn-to-ski programs, grouped by ages 7 to 12 and 13 to 17. Other winter activities include cross-country skiing, snowboarding, and ice skating at Half Dome Village. Greek Peak Mountain Resort features Junior Ride and Ski School for children as young as 3, and families can enjoy sledding, snowshoeing, snow tubing or riding a fat bike — designed to traverse snow and other rough surfaces. 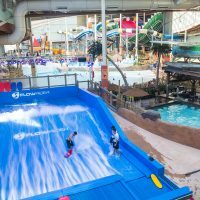 When you’re not descending snowy hills, plummet down the waterslides at Hope Lake Lodge’s Cascades Indoor Water Park, located right at the ski resort. Lessons for skiing and snowboarding are just the beginning of the fun at Colorado’s Beaver Creek Resort. The expansive resort also offers kids’ programming via Beaver Creek Loves Kids and Beaver Creek Loves Teens, available at peak visitation times. Activities include pizza parties, arts and crafts, and excursions on the mountain. The fun continues with ice skating, snowshoeing, themed events (don’t miss WinterFest) and even a children’s museum. There’s certainly no shortage of lodging for families, either, from vacation rentals to luxury hotels. Bonus: Free chocolate chip cookies are served at 3 p.m. daily at Beaver Creek Resort! Smugglers’ Notch in Vermont is a dream destination for skiing families — and with good reason. The resort offers several incentives for families, such as Kids’ Night Out, a childcare service with dinner and activities, and a FamilyFest Package that includes lodging, lift tickets, activities and more. Children as young as 2 and a half can learn to ski, and all new skiers are placed in lessons with other children their age. When teens aren’t ice skating, snowmobiling or Airboarding, they can hang at Teen Alley, where there are video games, music, movies, organized events and new friends to meet. Our favorite offering at Smugglers’ Notch? Adaptive programs for those with special needs, from skiing to arts and crafts. At Steamboat Springs, kids ages 12 and under ski free when their parents or grandparents purchase five-day lift tickets. Children ages 12 and under are also eligible for a complimentary season pass with the purchase of an adult season pass. Kids as young as 4 can learn to ski on the resort’s kids-only terrain, with lessons divided by age groups. Snowboarding, snowmobile rides, gondola tours, cross-country skiing, hot springs, spas and more than 100 restaurants add to the appeal.